Traditional settlements with cycladic architecture, intended coastline with sandy beaches, endless vineyards and age-old monasteries decorating the mountains with the famous Parian marble. An Island with rich history and dazzling natural beauty, which will win your heart from the first sight. From the imposing church of Ekatontapyliani and the ancient monuments to the valley of the butterflies and the dazzling beaches. The coastline is indented, with numerous small inlets and two large bays, those of Naoussa in the north and Parikia in the west. 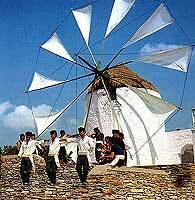 Paros has been inhabited since very ancient times , and was one of the centres of the Cycladic civilisation. Parikia (or Paros), the island's capital and port, stands on the site of an ancient city. There is a picturesque and ruinous Venetian castle, and the courtyards of the houses of the town - all of them painted white - are full of pots of basil and hung with jasmine and honeysuckle. A broad paved avenue leads to the church of Ekatondapiliani or Katapoliani, one of the most important Byzantine monuments in the whole of Greece and a place that figures largely in legend. It is dedicated to the Dormition of Our Lady, and on her feast day (l5 August) there is a great celebration on the sea-front with fireworks and songs of the sea. Naoussa, one of the prettiest villages in the Cyclades, with whitewashed houses, narrow paved alleys, arches and tiny chapels, can also offer a range of excellent beaches and attracts many visitors each summer. Among the beaches near Naoussa, special mention should be made of Kolimbithres, where huge rocks eroded into strange shapes remind the visitor of sculptures embedded in the sand. The chapels and monasteries of Paros are famed for their picturesqueness; among the most characteristic are the monastery of Zoodohos Pigi "Longovarda" and that of Christ of the F orest (Hristos tou Dassous). Marpissa is an attractive large village with a Venetian castle and beautiful churches. Paroikia - Care should be taken when approaching Paroikia there several islands and reefs surrounding the entrance to Paroikia so you should consult your Greek waters pilot as well as your charts. You should get in early into the harbour especially if there is rough weather as to find a place on the inner mole. If not then you will have to tie on the outer mole which can be come uncomfortable. Fuel and water are available as well as provisioning. There are several cafes and tavernas to choose from. Take a stroll in the old town of Paroikia. Naoussa - There is a small quay to tie on but there is limited space. Naoussa is a pleasant harbour especially if there is calm weather. The cafes and tavernas are very welcoming. Take a walk to the Venetian fort. Piso Livadhi - This is a small bay with a quaint village. There is a small mole which offers generally good shelter from the meltemi. Water is available at the mole and some provisioning can be bought at one of the mini markets. 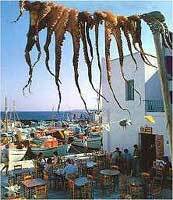 There are several tavernas for eating out at. During the 10th century B.C. came to Paros the Arkades. The leader of the Arkades was Paros, who nammed the island. Before Arkades, the Cretes had settled and used Paros as a harbor. The golden age of the island, though, was the 8th century. It was then when the island begun to gain money from the white marble and became one of the greatest nautical forces. The most beautiful beach of Paros is Kolimpithres. Piso Livadi, Logaras, Pounta, Chrisi Akti, Drio, Ambela, Glifada and Kefalo are some of the wonderful beaches that can be found on the island. In most of the holiday resorts you can find clubs, pubs and bars. In Paroikia you can find buzukia and in Ambela there are taverns with traditional music. You can rent surfboard on the island for windsurfing. You can also play tennis on the island.